FILL & TIE 105 WATER BALLOONS IN LESS THAN 60 SECONDS! When will I receive my Bunch-O-Balloons? Its been over 48hrs and I have not received my tracking #? Its been over 25 days (standard Shipping) or 15 Days (Priority Handling) and I have not received my Bunch-O-Balloons? How do I fill my Bunch-O-Balloons up? 2. Attach the Quick Connector to the hose fitting and turn on water. 3. Fill till the balloons are the size of an apple and shake. They will fall off the straws and self tie. What will happen if I don’t turn off the water? What to do after using them? The balloons and O-rings are biodegradable and environmentally friendly. The straws are recycled plastic. Please recycle. How many balloons in a pack? 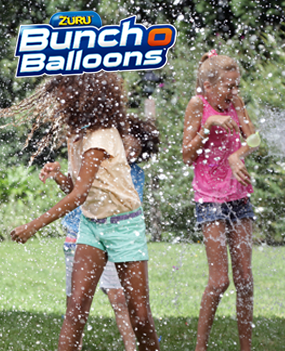 35 balloons per bunch and 3 bunches per pack. That’s 105 balloons! Are bunch of balloons safe? You will need to email your reason for cancelling the order before your refund can be processed. Your satisfaction is important to us and is 100% Guaranteed. If you are dissatisfied with any merchandise for any reason, simply return the product within 30 days of receipt for a full refund of your purchase price, excluding shipping and handling. To return an item, we request that you first contact us buybuchoballoons@zuru.com to obtain a Return Authorization # (RA#) Postage costs you incur to return an item are non-refundable. Unauthorized or hand delivered returns will not be accepted. How long will a replacement take? We only use your details for the purposes of transacting your order and customer services. Offer Details: You can get Bunch-o-Balloons for just $9.99 + $5.99 shipping and handling. Each Bunch fills 35 Balloons and you’ll get 3 Bunches - that’s 105 Balloons!! Hurry because this offer won't last long!